No. Bad Nokia! Put down that Android at once! Know any Nokia fans? Noticed that they seem giddy, like their dreams are finally coming true? It's because the Finns could FINALLY be making an Android handset. The NokDroid project has been up and down more than a demented see saw. First, Nokia was developing an Android handset, fulfilling the liquid fantasy of geeks everywhere. Then the project was off. How could Nokia even consider such a thing? It's (sort of) owned by MICROSOFT for Gawd's sake. And now, it looks like it's back on. I can't keep up with this. I've never been the biggest fan of Windows Phone. Don't get me wrong. It's very nice. It has tiles. TILES. Who needs widgets? But I personally find it to have too many nuances. On one side, there's Android, which will let you customise to the hilt. On the other, there's iOS, which will barely let you change more than the wallpaper. 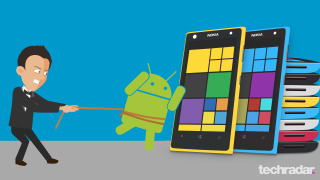 Logically, Windows Phone should fall into the gap in the middle. But for me, it doesn't work. Hell, that's me. And I know the vehement fans of said OS will tell me I'm wrong. Go for it. But despite that opinion, I'm all for competition, so Windows Phone needs to be given a chance. It needs to develop more if it is to become a credible competitor to Apple and Google. And Nokia needs to concentrate its efforts there. Be a master of one trade, not a jack of them all. How would Windows Phone feel if it had emotions? Like its husband is constantly looking at others to see if they'd be a better partner. That's how. Nokia is supposed to be the faithful hubby. The company looked like it was on its deathbed until boss Stephen Elop announced that he was flogging the family silver and taking WP as the provider's OS. Which looks like it's paid off, as the company doesn't appear to be on the brink of bankruptcy anymore (partly helped by the billions slung into the coffers by Microsoft). Nokia phones are actually cool devices that many want to own again. That's pretty good in terms of reinvention. But this apparent renewed interest in just trying to keep another project on the boil seems to be eating away into what should be a 110% commitment to Windows and nothing else. Just look at the screenshots. Android's beauty is that it can be skinned easily. It can look like anything you like. So what is Nokia doing? It's making an Android UI that looks like Windows! What's the point?! Do you want to confuse your buyers, Nokia? You're going the right way about it. By calling it a 'project', it makes it sound all Google Labs. You know, fun. Inventive… cheeky even. But it's not, it's just giving the critics another reason to beat you when it comes to nothing. You can't hope to become a key player here, Nokia. Samsung, HTC and Google themselves pretty much have Android sewn up. Sony and LG are on the periphery. How are you going to take them on when your dedication is really to Microsoft? A far better strategy would have been to continue with MeeGo. Geeks worldwide sobbed to themselves when that bit the dust. The only MeeGo handset became a bit of a collector's item. Going forward with a half hearted attempt makes you look weak. And you're not – you're the bastion of our phone world. Don't go changing!